Belcolade Couverture Chocolate, Dark, 10kg box of BUTTONS At the beginning of the 16th century, during the conquest of Mexico, the Spaniards learnt about Cocoa. For the indigenous population (the Aztecs), the cocoa bean was of divine origin: that is why Linnaeus named the Cocoa tree Theobroma cacao (Theobroma = Food of the Gods). The Aztecs roasted and ground the beans and diluted them with water to produce a cloudy drink they called "Cacau-atl". To this they added vanilla and other spices. The Spaniards took this back to Europe, and by about the 1700's the drink Cocoa was widely known. Primitive by today's standards, the exportation of the trees began, and the consumption and trading of cocoa increased. In 1828 a Dutchman by the name Van Houten discovered a method for removing a large proportion of the fat from the Cocoa. This became Cocoa butter. Production of bars and slabs of chocolate began. Couverture chocolate has a higher percentage of cocoa butter, which lowers the melting point making it particularly good for coating confectionery, cakes, decorating and moulding. A good chocolate is shiny brown, breaks cleanly, and is free of lumps and air pockets. The aroma should be of pure chocolate, not cocoa powder, and it should melt on the tongue like butter. The more cocoa butter it contains, the softer and creamier it should be. Plain Chocolate, is composed of cocoa mass, cocoa butter, sugar, lecithin. 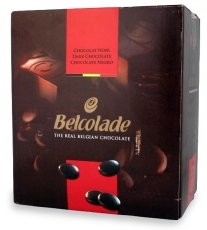 Belcolade add the right quantities of these fine substances and blends them, with the intention of flattering the most delicate palate. Belcolade is all of this and more. The home of quality chocolate is Belgium. This quality product is also available in a 5kg block.